Hello lovelies, I hope you've all had a splendid week with a wonderful weekend to come. I just wanted to share a little wisdom, and my obsession for my beloved Chuck Taylors. 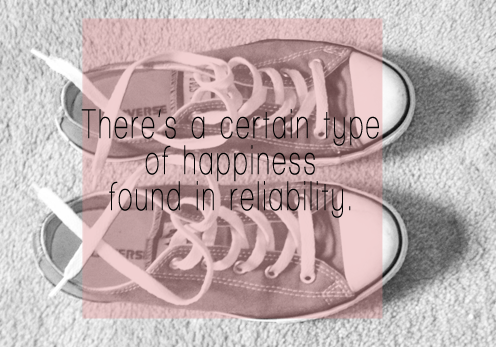 "There's a certain type of happiness found in reliability." A quote, by me, that emerged from too much time alone with my own thoughts. Crazy how your own thoughts can lead to beautiful realizations, or terrible conclusions, in this case a beautiful realization. I seem to get a happy "high" from knowing certain things just work, and will work, in layman's terms are reliable. It's a comforiting feeling and a welcome one in my book. Knowing something or someone can be counted on for their reliability gives me joy, and as said in the quote above a certain type of happiness. So my lovelies, is there in random beauty of life you come upon randomly, or am I the only weirdo with wayyyyy too many epiphanies on a daily basis? Let me know! I love sharing small beauties of the word and would love for you guys to share some too! Happy Friday, wishing you a great weekend! PS. Love your new blog layout! I did! Ha, I had forgotten I did that! And thank you! Oh so true! I wish I could come up with my own quotes, my Pinterest is full of them!